Chef Meherwan Irani serving up joy with every bite. 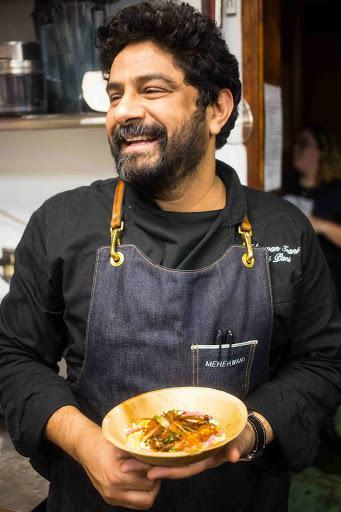 Asheville-based chef Meherwan Irani has been nominated for three James Beard Awards and co-founded a restaurant group with his wife, but he has no formal culinary training. He started cooking Indian food as a hobby born out of frustration with the lack of good Indian food options in the United States. With guidance from his mother, Irani recreated his favorite childhood foods in his own kitchen. Host Frank Stasio talks to Asheville's Meherwan Irani about his background and career in the restaurant business. He studied business in college, sold luxury cars for 10 years and then tried his hand at real estate selling high-end second homes. After his real estate career was cut short by the 2008 recession, his wife suggested that he turn his hobby into a profession and open a restaurant. Today Irani is the CEO, co-founder and executive chef of the Chai Pani Restaurant Group and is often credited with revolutionizing Indian food in the United States. He has restaurants in Asheville and outside of Atlanta. He also helped to create the “Brown in the South” supper series, a number of collaborative dinners featuring chefs of Indian descent who have all made the South their own. Irani talks to host Frank Stasio about his background and career in the restaurant business. I was in such a small town — almost a village — and it was so insulated, but then to have this influx of Western civilization into the middle of this town in the middle of nowhere really had a remarkable impact on me growing up. I grew up reading Western books, Western novels, watching Western movies, having access to Western music. These are things that nobody in school could relate to or had any concept of. So it formed a very Western identity in me. I almost identified more strongly with this country I had never been to — America — than I did with where I was growing up. Sometimes in an entire week the only time I'd see [my daughter] was when my wife would bring her by for a lunch break. And after about six to eight months of that, Molly looked at me and said: We can't do this. We went through so much to bring this child into our lives and here we are. She's being raised by babysitters, and you barely see her. Something's gotta give. I got to Columbia, South Carolina and started missing home cooking and Indian food. So I went to the first Indian restaurant in town, which is everything you'd imagine it'd be: in a strip mall and what we call a curry house serving North Indian specialties, [and] half of them are westernized ... But that was the experience over and over again. Every Indian restaurant I went to — thinking that: Oh, maybe that last one only specialized in that food. Maybe I'll find one that serves normal food — were all doing the same thing ... It just offended my sensibilities that this was the best we could do, because I knew the food we had in India. I knew how remarkable it was. I'd grown up eating it. My first thought was: I have to go and get an education. I need to be qualified if I'm going to do this and do a restaurant serving this kind of food. But that was an insane thought. It would cost many thousands of dollars. I wouldn't be able to work, and here we're in the middle of a recession. That was not going to help anything. So for a little bit there I thought: Yeah, this idea's not going to go anywhere. There's just no way I can pull this off. And then I sat bolt upright in bed one night while I was thinking about it and just realized: I don't need to go to culinary school. I'm not trying to cook somebody else's food. I'm not trying to master French cuisine or Italian cuisine and learn the mother sauces and learn sous vide and all these fancy modern American culinary techniques. I'm trying to do my food, and I'm pretty sure they don't teach that in culinary school. In one of our kitchens in Chai Pani Decatur painted above the wall in the kitchen it says: Mastery and Servitude. The idea being that if you want to be really really good at what you do and really be successful, the only way to do that is this idea of servitude. And it comes again from India and my spiritual upbringing and background and this idea that you start with giving back and you build a business around that. And when I opened the restaurant, my idea of taking care of people was my family, my wife and my kid, and that's why I did this. But the minute the first employee walked into that door, I knew that it was no longer about taking care of just my family. Now as much as responsibility one feels towards a wife and a child, that same responsibility is now transferred to that first employee and the second and now the 200th and every customer that walked into the door. Cheetie Kumar grew up in Chandigarh, India with America on the mind. Her family talked often about moving overseas to pursue a fresh start in the United States. Her parents lived through Indian Partition in 1947, a bloody conflict during which Kumar’s mother lost both of her parents. For their family, moving to the U.S. was both about finding new opportunities and gaining distance from trauma. Edna Lewis changed the perception of Southern food in American culture with her cookbook, “The Taste of Country Cooking” (Knopf/1976). She touted the use of fresh, local ingredients before the farm-to-table movement began. But many people know very little about the chef and cookbook author, despite her many contributions to food culture.